If you have kids you know what I’m about to describe. You have wiped the fingerprint smudges from a Disney DVD, loaded it in the player all while your kids are screaming to see it. On comes the FBI warning, then the Interpol warning (sometimes in French, that’s really helpful), then comes Disney’s extra special patent pending technology, Fast Play. Here is where it breaks down for me. Shouldn’t Fast Play actually start the movie fast? But if you make that selection it actually just starts the parade of trailers; one mind-numbing preview after another. All the while your kids are losing it and demanding to see Bambi. But if you select Main Menu instead, you bypass the trailers and can start the film much more quickly. One additional tip here, you can actually speed up getting to the feature by going to Scene Selection after arriving at the Main Menu and selecting a chapter, usually chapter 1. That little trick can reduce screams by as much as 15%. I know Disney wants to promote their other products, and they have a right to do so, but don’t mislead and frustrate parents and their children with this kind of labeling bait and switch. You can read Disney’s FAQ on Fast Play here. I get a kick out of how they spin it as if they are helping families. One other thing, Don’t you love it when someone gives you one of their old Disney titles and it shows a preview for a film, then proudly announces that it’s coming Fall 2002? I bought the movie on DVD, and I should be able to use my remote control to start watching it immediately. It’s fine to put promotional material on the disc, but give the customer real choice, not a corporate contrived choice. Just wait till I blog about the experience we are now made to endure when we pay for a first run film in the theater. 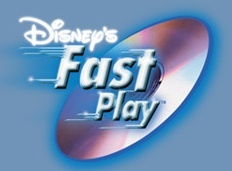 Disney’s FastPlay is a lie. False advertising FTL (for the loss).